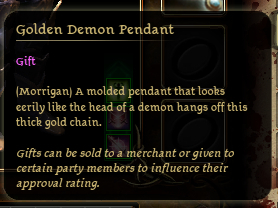 Adds (Intended Companion) Text to the front of a gift item description. Also lets you know if an item is plot related. ** Remarkable Gemstones are part of premium content and thus I cannot edit the file description. If you find a Remarkable Gemstone Shale would like to know about it. Because this only modifies the item description, if you pick up an item for a companion you don't have yet you'll know that you could have that companion. The below information lists the items changed and who they are intended for. If you don't want to know who your future companions are don't read below or use this mod.